Perfectly suited for marine life and invertebrates, the light spectrum of the Blue Moonlight has been specifically designed to enable corals (that can) to fluoresce, creating a stunning display, and also uses the 03 Actinic spectrum widened to enhance visibility of your fish at night, especially catfish and crustaceans. For healthy growth of corals, ensure the corals get all the light required by using Reef Daylight during the day and Blue Moonlight at night. The Blue Moonlight lamp is a great addition to complement any of the other Interpet lamps. 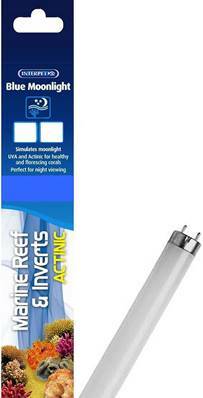 When used at night it allows you to see nocturnal fish as well as providing a spectrum to allow corals to be seen fluorescing. To ensure minimal stress for the fish, use a timer so the Moonlight lamp comes on before and goes off after other lighting. •Suitable for Marine Aquariums with corals and invertebrates.